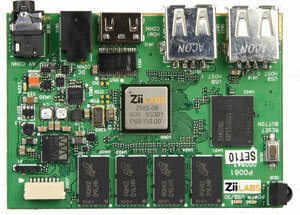 ZiiLABS and ARM have teamed up to develop a new digital home platform called SiVO. The processor was released at last month’s Consumer Electronic Show (CES) and features a combination of ZiiLABS StemCell Computing Array and ARM’s 1GHz Cortex-A8 processor. The SiVO platform is a single System-on-Chip (SoC) architecture that offers 1080p Blu-ray quality HDTV and 3D graphics from low-power connected home devices. The SiVO digital home platform features StemCell Computing Array with 64 fully programmable floating points. This allows manufacturers to quickly develop and supply connected home devices that consumer wants. The flexible array within the SiVO architecture enable users to experience the widest range of community and commercial generated content including OpenGL ES, H.264, MPEG4, Adobe Flash, MPEG2 and Microsoft WMV9. The SiVO Cortex-A8 processor integrates NEON™ technology for multimedia and signal processing, TrustZone® security for commercial transactions such as the ability to pay for on-demand content. The processor also features a 256K L2 cache for enhanced web 2.0 browsing performance and a 15byte addressable RAM.